Courduroy-lined fur gauntlets and cap brought back from Russia by Captain Ramsay. While France and Germany served as the battleground for the vast majority of Wisconsin troops during World War I, some soldiers–including Captain Ralph E. Ramsay of Beloit, Wisconsin–found themselves stationed far away from the Western Front. During the summer of 1918, President Woodrow Wilson acquiesced under pressure from Great Britain and France to assist them in North Russia. Wilson agreed to send a limited amount of troops to the region to help guard stockpiled war supplies from the Bolsheviks. The 339th Infantry Regiment, under which Captain Ramsay served in Co. F, was rerouted to Archangelsk (Archangel) in northern Russia that August. 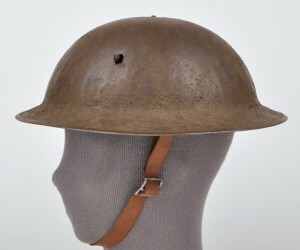 Bullet-pierced helmet worn by Ramsay when he was shot during battle in Vistafka, Russia. Under British command, the approximately 5,000-strong operation took on many names, including the Northern Russian Expedition, the American North Russia Expeditionary Force (ANREF) and the Polar Bear Expedition. 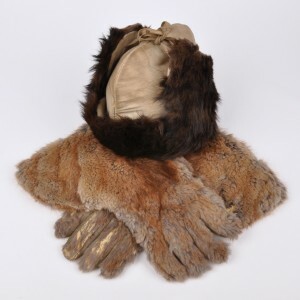 The gear they returned with reflects the harsh environment they were subjected to, such as the muskrat fur gauntlets and cap brought home by Ramsay. The realities that met them in Archangelsk, including supplies that had already been absconded with by Bolshevik forces, difficulty in maintaining an offensive posture over great distances and a quickly advancing winter forced the Allies to instead focus on merely maintaining their position. Already by June 3, 1919 a request was submitted to make a white polar bear on a blue field the official insignia for the ANREF. Even though the Allied Armistice was signed in November, ANREF soldiers remained more or less stranded in Russia. Despite increasing protests both there and at home, soldiers were forced to stay until June of 1919. Still, regardless of the perceived failure of the mission, those men who survived their winter in Archangelsk proudly declared themselves “Polar Bears”. 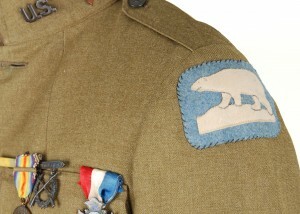 The polar bear was shortly thereafter adopted as the official insignia for the ANREF, and was worn by Ramsay on his coat for the remainder of his service. See more of the Ralph E. Ramsay collection in our online database.